Length: 15 3/4" R/S: 18"
The most widely used military helicopter, the Bell UH-1 series Iroquois, better known as the "Huey", began arriving in Vietnam in 1963. Before the end of the conflict, more than 5,000 of these versatile aircraft were introduced into Southeast Asia. "Hueys" were used for MedEvac, command and control, and air assault; to transport personnel and materiel; and as gun ships. Considered to be the most widely used helicopter in the world, with more than 9,000 produced from the 1950s to the present, the Huey is flown today by about 40 countries. 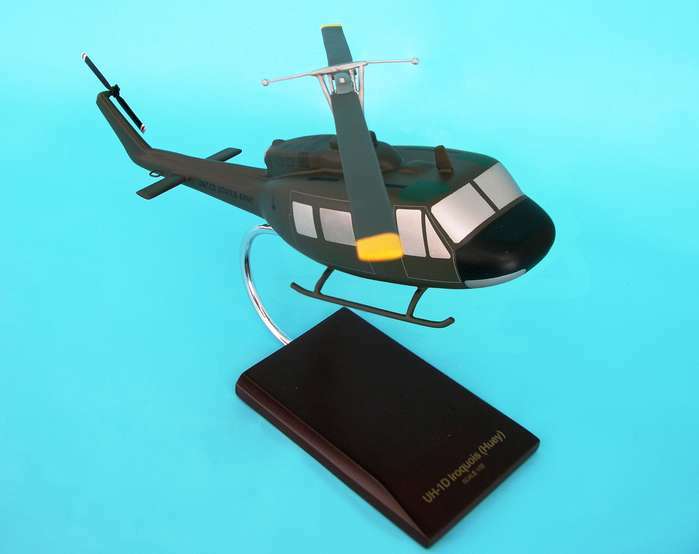 Bell (model 205) UH-1D (1963) had a longer fuselage than previous models, increased rotor diameter, increased range, and a more powerful Lycoming T53-L-11 1100 shp engine, with growth potential to the Lycoming T53-L-13 1400 shp engine. A distinguishing characteristic is the larger cargo doors, with twin cabin windows, on each side. The UH-1D, redesigned to carry up to 12 troops, with a crew of two, reached Vietnam in 1963. The UH-1D has a range of 293 miles (467km) and a speed of 127 mph (110 knots). UH-1Ds were build under license in Germany. UH-1D "Hueys" could be armed with M60D door guns, quad M60Cs on the M6 aircraft armament subsystem, 20mm cannon, 2.75 inch rocket launchers, 40mm grenade launcher in M5 helicopter chin-turret, and up to six NATO Standard AGM-22B (formerly SS-11B) wire-guided anti-tank missiles on the M11 or M22 guided missile launcher. The UH-1D could also be armed with M60D 7.62mm or M213 .50 Cal. pintle-mounted door guns on the M59 armament subsystem.